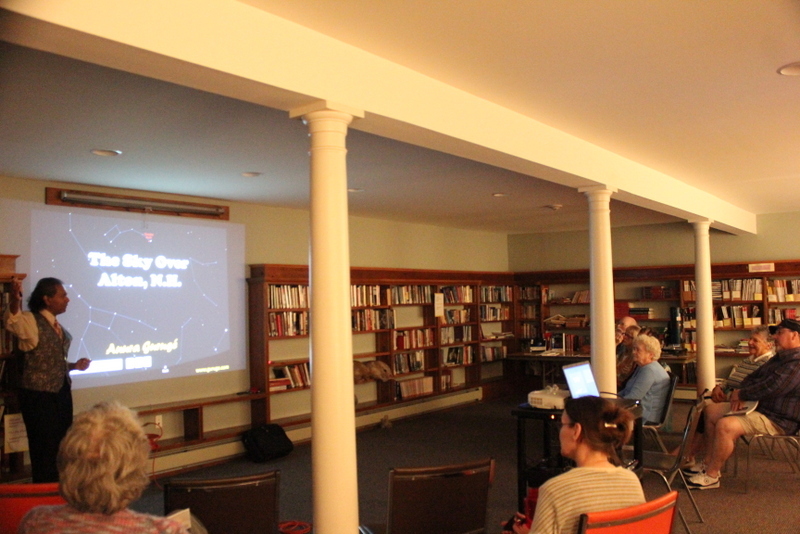 Alton (N.H.) Gilman Library, “Sky Over Alton” Astronomy Presentation, October 17, 2014 — Some Pictures. >> Slides for Alton Library astronomy presentation. >> — Oct. 5, 2014. 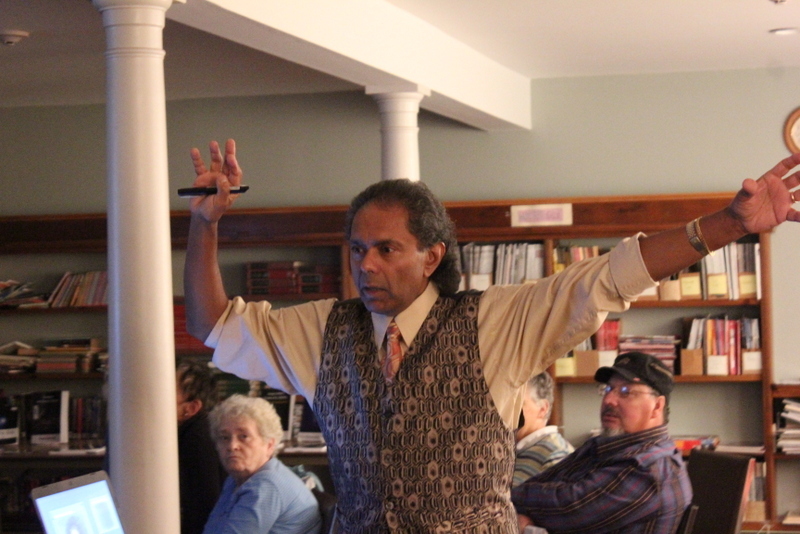 >> Oct. 17 Alton presentation in ‘Baysider’ — Oct. 9, 2014. All these pictures (bar the first two) were taken by Devanee Guruge. 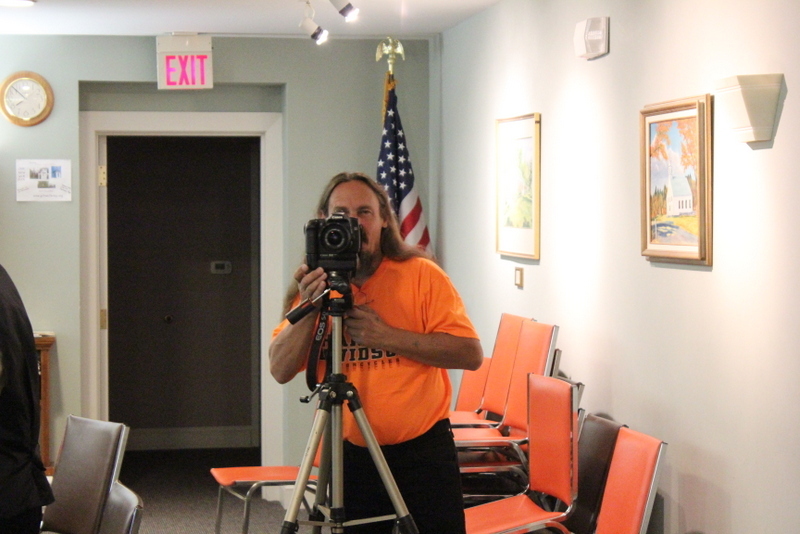 Alton photographer, John Bishop, a friend, who arrived and joined Devanee in taking pictures. So I had two tripods with cameras at the back. It wasn’t packed but the folks that were there were very receptive and engaged. I had planned for about 90 minutes but we were still there, having a lot of fun, 2 hours later. They seemed to really like it — or at least that is what they claimed. I had fun. But, I have never done a presentation where I have not had fun. Our friend, Alton photographer, John Bishop, turned up — unexpectedly given that we thought we was going to be in Manchester visiting a friend that was in hospital. John set up his, professional grade Canon, and started taking pictures in tandem with Devanee — who relished the opportunity to use my Canon. I should get John’s pictures on Sunday. Part II of this astronomy presentation is on Friday, November 20, 2014. You can come to that even if you didn’t come to last night. They are self-contained, though I will not go over the same material. So that was that. I am glad that I did it. 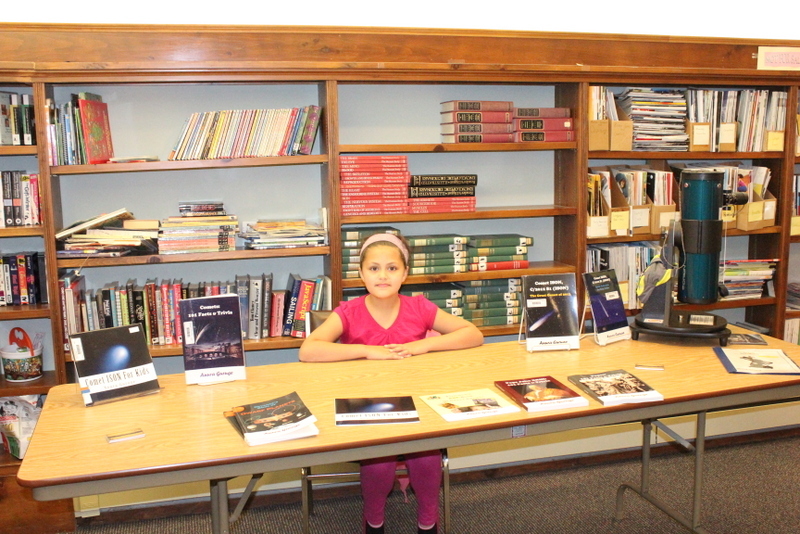 Holly Brown, the librarian, always extremely nice, had displayed my astronomy books on a table etc. She was very happy, and that was good. 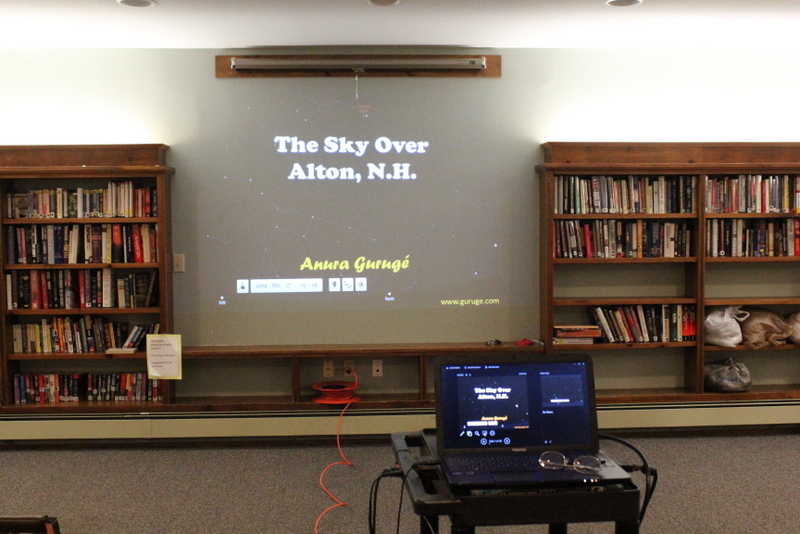 Slide (Hardcopy) For Gilman Library, “Sky Over Alton” Astronomy Presentation On October 17, 2014. 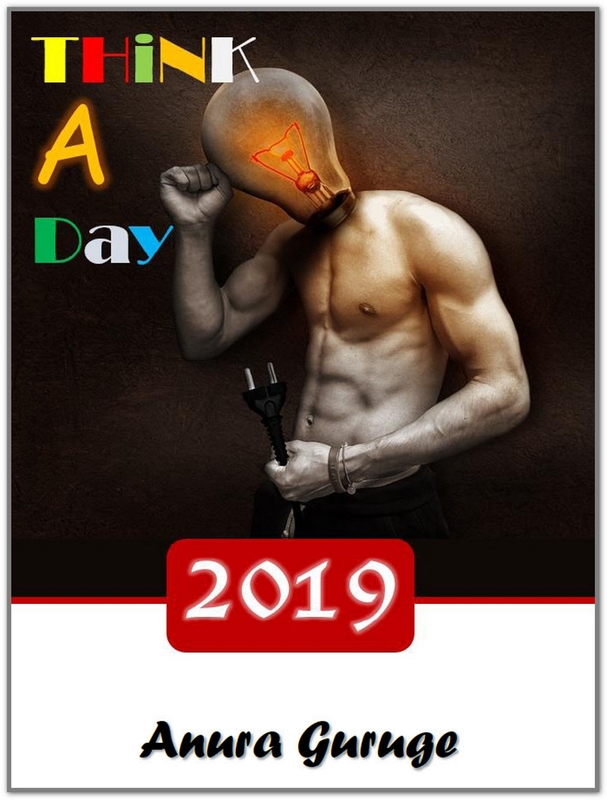 Click image IF you want to download a 3.2MB Adobe Acrobat PDF of the slides. I tried to keep the transitions to a minimum so that most of the images will appear in the PDF. But, I am so used to using animation that I did NOT succeed entirely — though, I think, this is the BEST I have ever done. So IF some slides don’t make sense or they look incomplete is because there are OVERLAY transitions [i.e., animations] that don’t make it to the PDF. Sorry. The slides. Click to ENLARGE. Use image above to download PDF of the slides. See caption notes ABOVE. 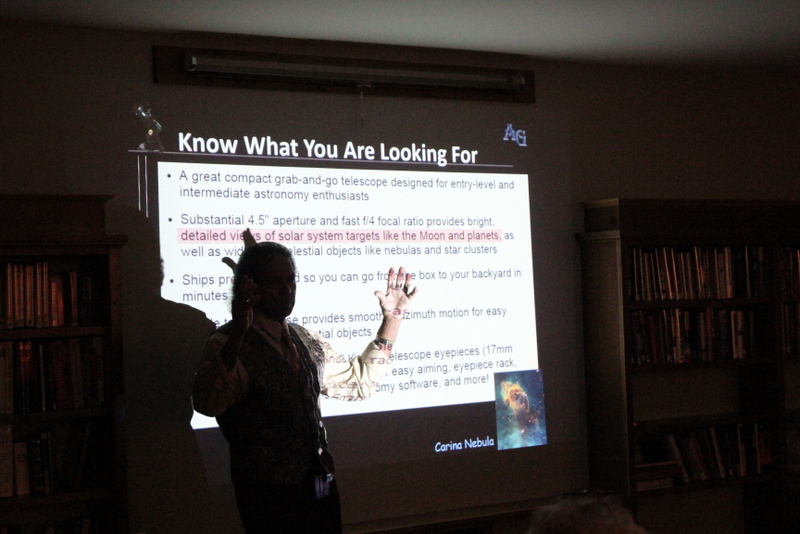 Telescope & Astronomy Presentation At The Alton, N.H., Gilman Library On October 17, 2014. — which has more details. Click here to access the Gilman Library Webpage about this presentation. This relates back to my ‘Comet ISON‘ presentation at the Gilman Library last November. It went well, was reasonably well attended and, most of all, well received. Holly Brown, the librarian, was very pleased. Since then I have kind of become a de facto local ‘expert’ on all things to do with the skies. So when they received this telescope in the Summer she asked me to have a look at it and see if there was anything I could do to kind of kick it off. These two presentations, which were supposed to have been in September & October, but are now in October & November are the outcome of those conversations. I haven’t had the time to actually use this telescope. I have, however, told a number of kids to borrow it from the library. Peering through telescopes is no longer my thing. Which is why we are down to just one telescope at home. With my eyesight and time constraints I am much better off looking at images on the computer. And ironically that is what professional astronomers do. But, I am all in favor of kids exploring the skies with a telescope. So I am very glad that we have this cute little telescope at the library. Now I have to start thinking about putting together a presentation for October 17th. It should be fun. So much I could cover. The sky is the limit. 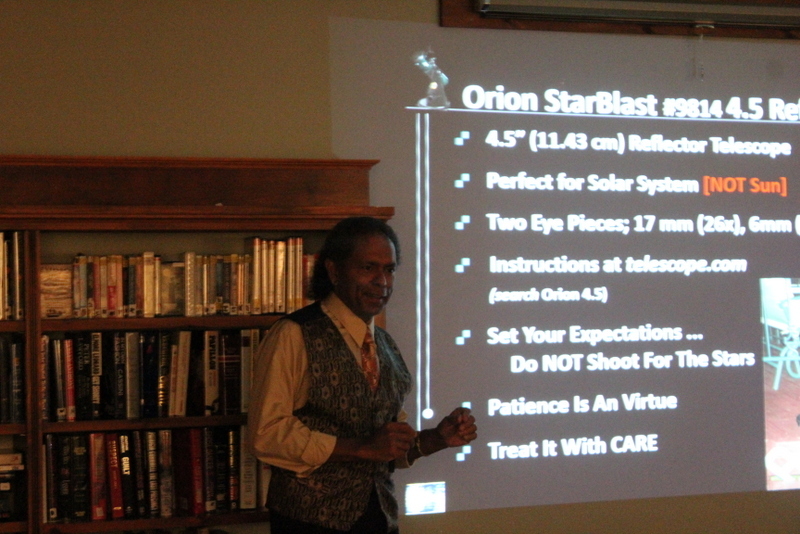 My ‘Comet ISON’ Presentation For Portsmouth, N.H. Rotary International Club, Today. Click any of the pictures to ENLARGE. Since Rotary is famous for their auctions to raise money for the Club, I gave them a copy of one of my books to auction. It went for $55! Wow. It is for the Club and everybody knows that. But, I was so happy. I used to be in Rotary. I was even the Sergeant-At-Arms. 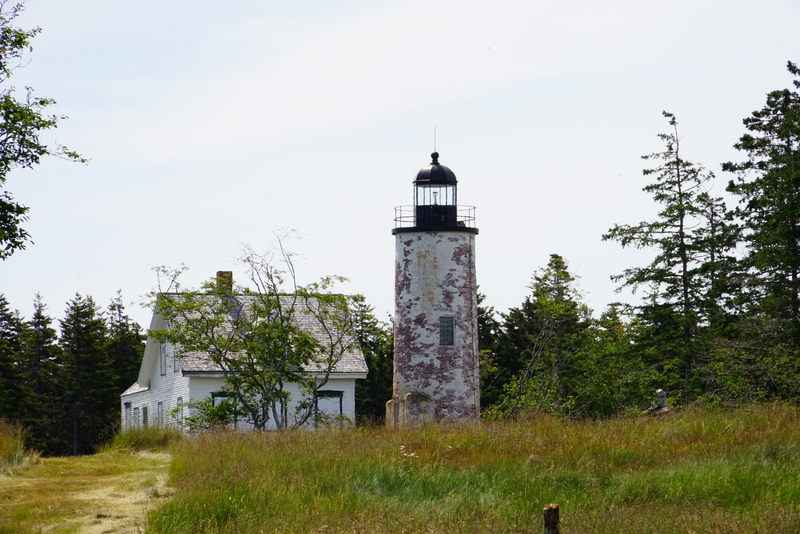 I offered my ‘Comet ISON‘ presentations to a number of N.H. Rotary Clubs BUT Portsmouth was the only one that took me up. I am glad. What a club. Close to 150 members. I thought Laconia was big at 100. Very, very nice people, but that tends to invariably be the case with Rotary. Even made me a bit nostalgic. I had fun at Rotary. Being Sergeant-At-Arms suited me. The meeting was at the very salubrious ‘Portsmouth Country Club‘. What a great lunch. I had a great time. Lovely people. I think they liked the presentation. I only had 20 minutes, so I had to keep it pithy. I have offered to come back and do a different presentation next year. This was fun. Deanna went with me, as she does to most presentations I do. She really liked it. That they auctioned off one of my books for $55 was a blast. That was a compliment. I love Rotary auctions. I used to be a bidding addict. It is for a good cause so that makes it rewarding. I just LOVED that they read out LOUD the famous Rotary 4-Way TEST. I am a great believer in the 4-Way Test. Though no longer a Rotarian, I think, I still live by the 4-Way Test. Thank YOU, Portsmouth Rotary. That was fun. Can’t wait to come back and do another presentation.